Outstanding young Australian student from Cunnamulla in SW Queensland Wallace Dunsdon has been named as one of ten 2008 Charles Hawker Scholars. Hawker family member, (Member for Wannon and former Speaker of the House of Representatives) Hon David Hawker MP, presented the recipients, from five states, with their scholarship certificates at a series of commemorative functions on Saturday 23rd and Sunday 24th of August at Bungaree Station in South Australia. The Charles Hawker Scholarships, valued at up to $60,000.00 over four years, are the most generous privately funded scholarships available to undergraduate and postgraduate students in Australia. Student, soldier, pastoralist and statesman Charles Allan Seymour Hawker died in the Kyeema air disaster on October 25th, 1938. Others to perish when the Kyeema crashed into Mt Dandenong were South Australian wine identities Mr. Sidney Hill Smith, Mr. Hugo Gramp and Mr. Tom Hardy. The 70th anniversary scholarship presentation, woolshed dinner and St Michaelâ€™s church service included representatives of the Hawker, Hill Smith, Gramp and Hardy families at Bungaree Station, the birthplace and final resting place of C.A.S. Hawker. Former Premier of South Australia and Master at St Markâ€™s College Dr the Hon. John Bannon AO delivered the after dinner speech to the 100 guests. Wallace is enrolled at Marcus Oldham College in Victoria and is studying a Bachelor of Business in Farm Business Management. His goal is to pursue a career in the Australian Agribusiness sector as a consultant and sustainable rural property development. Wallace is from a rural property just outside of Cunamulla in South West Queensland. He attended the school of distance education and local school for his primary education before going to the Toowoomba Preparatory School for year 7. His secondary education was completed at the Anglican Church Grammar School (Churchie) in Brisbane as a boarder. At 'Churchie', he was heavily involved in the school-rowing program. 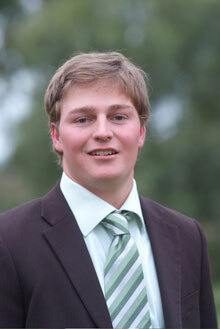 He was a member of the Schools First VIII crew (2003 and 2004) and was boatshed vice captain in 2004. He was selected to represent Queensland in the 2003 and 2004 State Rowing Championships. Wallace is an able student who applied himself to his academic studies. He is self-motivated and an independent thinker. He was successful in a number of academic competitions including Mathematics, Chemistry and English. In 2004 he received the Technical Studies Subject Prize and the Ian Cameron Design Award. He represented Churchie in Rowing, Australian Rules Football, Rugby and Cricket, winning full and half colours in a number of these sports and was judged to be Rugbyâ€™s best and fairest in 2000 and most improved in 2003. He spent 2005 working on the family property during the worst drought on record. This was beneficial to his personal rural development and his family business would not have functioned without additional drought labor support. In 2006 Wallace entered his first year of tertiary education at Marcus Oldham College undertaking the Bachelor of Business Course in Farm Business Management. He was elected President of the first year Business Students for 2006 and was elected by the entire student body as Student President of the College for 2008. In 2007 as part of the Marcus Oldham curriculum, he worked for Suncorp as an Agribusiness Officer in the large NSW rural town of Wagga Wagga. His position involved working one-on-one with the Business Banking Manager in refinancing clients as well as looking after existing customersâ€™ business needs. In the future Wallace plans to target the more marginal semi arid regions where rural consultancy is difficult to access, due to the lack of resources and technology. This will provide rural businesses the opportunity to accurately benchmark themselves against other commercial and rural businesses. He believes his current Marcus Oldham Business course, time working in the Agribusiness Bank and with other rural consultants, will develop a detailed knowledge base and prepare him well for his chosen career. Wallace also has a keen interest in sustainable rural property development, in particular with irrigation, cropping and animal production systems. Heâ€™s a keen sportsman and is involved in club rugby, social tennis and water skiing. Wallace is a highly organised young man who has a positive outlook on life and is well regarded by his peers. 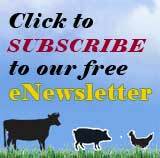 There is little doubt that Wallace Dunsdon will make a difference in rural Australia. 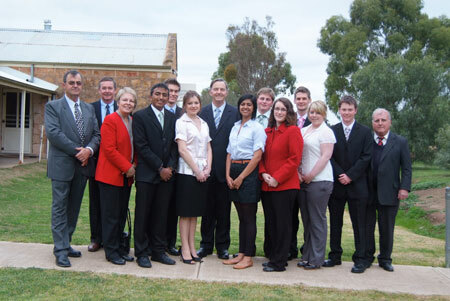 The other 2008 Charles Hawker Scholarship recipients are Mr. Trent Grgich (Hale School WA), Miss Ashley Jenkins (Penrith Selective High School NSW), Miss Katherine Radoslovich (Glenunga International High School SA), Mr. Vithiyasagar Sritharan (Dubbo College NSW), Mr. Samuel Stapleton (Dubbo College NSW), Miss Vrinda Tiwari (Presbyterian Ladies College NSW), Mr. Chris Warrick (Horsham College Vic), Miss Eleni Watts (Walford Anglican School SA) and Miss Sue-Lin Wong (Sydney Girls High School NSW). â€œI congratulate the Trustees of the Charles Hawker Scholarship for carrying out the wishes of Charles Hawkerâ€™s sister the late Lilias Needham, who established the Scholarship trust in memory of her brother.Â These scholarships have provided opportunities for an increasing number of young Australian students to undertake further studies to achieve their full potential,â€ Hon. David Hawker MP said. Since 1991, the Trustees have awarded more than four and a half million dollars to seventy-six young Australians, including a significant number from regional areas. 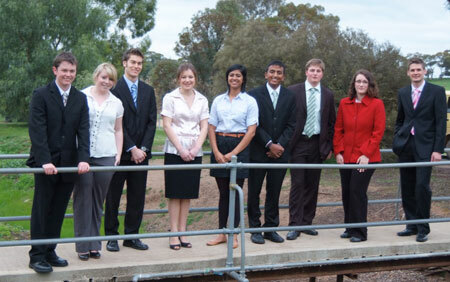 The ten successful candidates for 2008 were awarded a Charles Hawker Scholarship from a strong field of 240 applicants. Describing the Charles Hawker Scholarship as â€˜Australiaâ€™s Rhodesâ€™, Hon. David Hawker MP encouraged Australian students to visit the Hawker Scholarship website to find out more about the remarkable Charles Hawker story and the scholarship named in his memory. â€œThe Charles Hawker Scholarship is one of the most important in Australia. I commend the Trustees for the contribution the scholarship has already made and will continue to make to the education of a number of outstanding young Australians,â€ Hon. David Hawker MP said. There are a number of fully and partly funded scholarships awarded each year. The Trustees offer them to capable students of principle and character, who are committed to Australiaâ€™s future. â€œEach of these recipients has already displayed a strong commitment to the ideals upon which the Charles Hawker Scholarship Memorial Trust Fund is founded. They are gifted scholars with inquiring minds and have already contributed to the wider community. Charles Hawker had a lasting impact on Australian politics and all members of the federal house had an enormous respect for him during his time as Australiaâ€™s first Minister for Commerce in the Lyons government in the 1930s. â€œHe was a great Australian who offered his best through his commitment to his country, countrymen and women and democracy; these are values that I hope the scholars today take with them into their studies.Â Through his example and these scholarships itâ€™s my hope that public service will be included in the career options of recipients. â€œI am pleased to be associated with the Charles Hawker Scholarship. Charles Hawker was a cousin of my father, a connection that I am proud of and to be associated with these awards again for the fourth year, is a great pleasure,â€ Hon. David Hawker MP said. The Charles Hawker Scholarship perpetuates the memory and commemorates the achievements of one of Australiaâ€™s most respected pastoral pioneers. Born on May 16th 1894 at Bungaree homestead near Clare in South Australia, Charles Hawker was educated at Geelong Church of England Grammar School and Trinity College, Cambridge. Undergraduate and postgraduate Hawker Scholars are able to attend a range of educational institutions. These include the Australian National, Adelaide, Flinders, South Australian and New England Universities and Marcus Oldham College. Post-graduate Charles Hawker Scholars are able to follow in Charles Hawkerâ€™s footsteps by enrolling at Trinity College and studying at Cambridge UK. â€œC.A.S. Hawker was a truly remarkable man and a great Australian. This scholarship is a fitting tribute to his memory and each of these ten scholars is a very worthy recipient,â€ Mr. Andrew Hawker, Scholarship Trustee and Hawker family member said. Selection is based on personal qualities as well as academic ability. Applications for the 2009 Charles Hawker Scholarships open on December 1st 2008 and close on January 9th 2009.Â An application form and further information is available from www.hawkerscholarship.org or by contacting the secretary to the Trustees on 08 8127 1654. 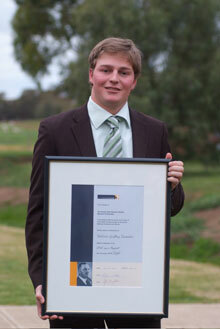 Cunnamulla student Wallace Dunsdon with his 2008 Hawker Scholarship certificate presented by the former Speaker of the House of Representatives Hon David Hawker MP at Bungaree Station in South Australia. Cunnamulla and Churchie student Wallace Dunsdon being presented with his 2008 Hawker Scholarship certificate by the former Speaker of the House of Representatives Hon David Hawker MP in the Shearersâ€™ Quarters at Bungaree Station in South Australia. (L-R) CAS Hawker Trustees Mr. Andrew Hawker, Mr. John Bastian and Ms Winnie Pelz, 2008 Hawker Scholars Mr. Vithiyasagar Sritharan (NSW), Mr. Trent Grgich (WA), Ms Eleni Watts (SA), former Speaker of the House of Representatives Hon David Hawker MP, Ms Vrinda Tiwari (NSW), Mr Wallace Dunsdon (Qld), Ms Katherine Radoslovich (SA), Mr. Chris Warrick (Vic), Ms Ashley Jenkins (NSW), Mr Sam Stapleton (NSW) and Chair of the CAS Hawker Scholarship Mr. Charles Hawker at Bungaree Station in South Australia. 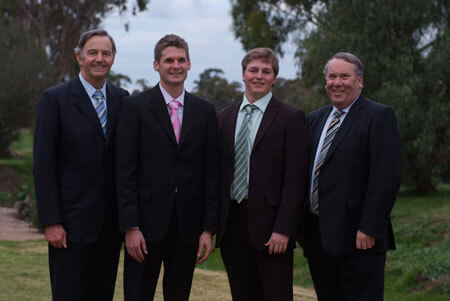 (L-R) Former Speaker of the House of Representatives Hon David Hawker, 2008 Hawker Scholar Chris Warrick from Horsham Wallace Dunsdon from Cunnamulla and Marcus Oldham College Director of Corporate Training Mr. Sam Inglis. (L-R) 2008 CAS Hawker Scholars Mr Sam Stapleton (NSW), Ms Ashley Jenkins (NSW), Mr. Trent Grgich (WA), Ms Eleni Watts (SA), Ms Vrinda Tiwari (NSW), Mr. Vithiyasagar Sritharan (NSW), Mr Wallace Dunsdon (Qld), Ms Katherine Radoslovich (SA), Mr. Chris Warrick (Vic), following the presentation of the 2008 CAS Hawker Scholarships at Bungaree Station in South Australia. Walace Dunsdonâ€™s parents Geoff and Cosette Dunsdon from Cunnamulla in Queensland attended the presentation of the 2008 CAS Hawker Scholarships at Bungaree Station in South Australia last weekend.